Prenate Mini® is a small and complete prenatal vitamin that provides you with the optimal nutrients in the optimal amounts. The Mini with the MaxTM is designed to make it easy for all women to take daily because it is a small, easy-to-swallow soft gel packed with all the nutritional support recommended during pregnancy. Prenate Mini® supports moms and moms-to-be who are often busy with many priorities and desire a prenatal vitamin that easily folds into her daily schedule! Prenate Mini® includes 14 nutrient forms created to help ensure maximum absorption of the ingredients while ensuring tolerability. 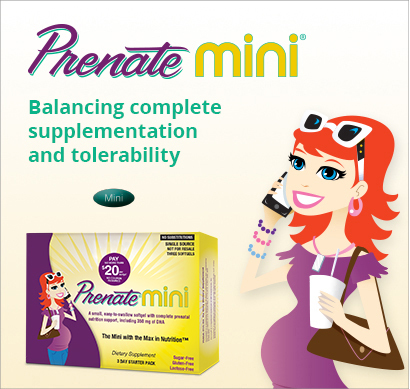 Prenate Mini® helps support healthy moms and babies! †Prenate Mini® contains L-methylfolate calcium. The L-methylfolate ([6S]-N5-methyltetrahydrofolic acid calcium salt) in Prenate Mini® is less than 1.0% D-isomer. REFERENCES: 1. Nestabs® prescribing information, Women’s Choice Pharmaceuticals website. http://www.wcpharma.com/wp-content/uploads/2015/02/nestabs.pdf. Undated. Accessed April 20, 2015. 2. NataChew® prescribing information, Eckson Labs, Sep 2012. 3. Prenate Pixie® prescribing information, Avion Pharmaceuticals, LLC, Jan 2015. 4. Vitafol® Nano prescribing information, Everett Laboratories, Inc, Mar 2014. 5. Prenate Mini® prescribing information, Avion Pharmaceuticals, LLC, Dec 2014-03. 6. Vitafol® Ultra prescribing information, Everett Laboratories, Inc, Sep 2013. 7. Vitafol® One prescribing information, Everett Laboratories, Inc, Oct 2012. 8. OB Complete™ Petite prescribing information, Vertical Pharmaceuticals, LLC, Sep 2014. 9. Prenate® Enhance prescribing information, Avion Pharmaceuticals, LLC, Sep 2013. 10. Prenate® Restore prescribing information, Avion Pharmaceuticals, LLC, Sep 2013. 11. CitraNatal Harmony® prescribing information, Mission Pharmacal Co, Jun 2014. 12. Nexa® Plus prescribing information, Vertical Pharmaceuticals, LLC, Apr 2014. 13. OB Complete™ ONE prescribing information, Vertical Pharmaceuticals, LLC, Sep 2014. 14. Concept™ DHA prescribing information, US Pharmaceutical Corp, Jul 2009. 15. Data on File/A, Avion Pharmaceuticals, LLC, Alpharetta, GA. 16. CitraNatal® DHA prescribing information, Mission Pharmacal Co, Nov 2012. 17. SelectOB®+DHA prescribing information, Everett Laboratories, Inc, Mar 2014. 18. Simopoulos AP, Leaf A, Salem N Jr. Workshop on the essentiality of and recommended dietary intakes for omega-6 and omega-3 fatty acids. J Am Coll Nutr. 1999; 18(5):487-489 19. ACOG. FAQ 001: Nutrition During Pregnancy. ACOG Website.http://www.acog. org/-/media/For-Patients/faq001.pdf?dmc=1&ts=20150218T1515531099. Published September 2013. Accessed February 18, 2015. 20. AAP. Statement of Endorsement: Dietary reference intakes for calcium and vitamin D. Pediatrics. 2012; 130:e1424. doi: 10.1542/peds.2012-2590. 21. Ross AC, Taylor CL, Yaktine AL, Del Valle HB, eds. IOM. Dietary reference intakes for calcium and vitamin D. Washington, DC: The National Academies Press; 2011. http://www.ncbi.nlm.nih.gov/books/NBK56070/pdf/TOC.pdf. Accessed September 18, 2014. 22. Kamdi SP, Palkar PJ. Efficacy and safety of ferrous asparto glycinate in the management of iron deficiency anaemia in pregnant women. J Obstet Gynaecol. 2014; Early Online: 1–5. Available at: 10.3109/01443615.2014.930098. Accessed December 29, 2014. 23. Pineda O, Ashmead HD, Perez JM, Lemus CP. Effectiveness of iron amino acid chelate on the treatment of iron deficiency anemia in adolescents. J App Nutr. 1994; 46(1,2):2-13. 24. Dietary Supplement Fact Sheet: Vitamin B6. Office of Dietary Supplements, NIH Website. http://ods.od.nih.gov/pdf/factsheets/VitaminB6-HealthProfessional.pdf. Reviewed September 15, 2011. Accessed November 2, 2014.